Are you ready for your "second adulthood"? Roadmap For the Rest of Your Life: Smart Choices About Money, Health, Work, Lifestyle ... And Pursuing Your Dreams. By Bart Astor. AARP/Wiley, 214 pp. Reviewed by Mallory Barbee, CAPM, credit administrator and marketing coordinator at Nantahala Bank & Trust Company, Franklin, N.C.
As a 20-something, I'm not expected to devote much time to considering retirement. But as a banker, I am probably more aware of the importance of short- and long-term financial planning than many others in my age group--and the perils of not facing up to the inevitability of retirement. Hopefully this awareness will be a helpful head start, allowing me to keep my later years in mind as I make my way through the decades that come between now and then. But whether you're starting early, like me, or considering your retirement with more urgency as it approaches rapidly, Roadmap to the Rest of Your Life is a terrific way to ease your mind and prepare for the transition. Astor is the author of numerous books and articles on topics ranging from eldercare to insurance to college admissions to corporate social responsibility. In Roadmap, Astor breaks down the multitude of "right questions" to ask yourself. He breaks retirement into manageable parts, divided into logical sections and complete with an index for easy reference. In the book's introduction, author Gail Sheehy calls the years after 50 the "second adulthood." We tend to overlook the fact that as medical advances seem to continuously increase our average life expectancy, this previous entryway into our later years will for many of us only be the midpoint of our lives. Even after successful decades-long careers and raising children to adulthood, our lives may only be half over. When then? For many, Astor notes, this is an ideal time to transition into a new way of life that will be just as long-term as the earlier era. We may pick up new hobbies, pursue new careers--even unexpectedly raise more children or grandchildren. We may travel, take an active role in charitable organizations, or go back to school. The possibilities are endless, and Astor encourages us to think of our post-retirement futures with excitement and hope. Astor's advice may be positive, but it is never pie-in-the-sky. Instead, he takes a refreshingly pragmatic approach. For instance, Astor spends significant time discussing the "level of activity (LOA) scale." The scale is simply a self-defined measure of how active we choose to be--or are able to be due to illness, disability, or other health concerns. A helpful grid provides a reference for how to measure your own location on the scale. Throughout the book, Astor discourages the reader from making value judgments. His position seems to be that something we are or do is not good or bad, it just is, and that negative thoughts must not bog us down. Even if you're on the low end of the LOA scale, Astor contends, you can still have a full and enriching life with plenty of hobbies, friends, and causes that excite you. Awareness of your place on the LOA scale merely helps you to set realistic goals and modify your desires to be attainable. To illustrate his point, Astor relates his own experience with limitations he experienced due to his own activity level. He found that as his body aged he was no longer able to exercise his beloved border collies. However, he modified the physical and emotional necessities of spending active time with his pets by taking up the sport of dog agility. Astor now spends time training his collies for competition, which is less taxing on him physically but still provides the bonding and exercise that his dogs require. The LOA scale is a great way of facilitating an internal dialogue about how to pursue and maintain the lifestyle you love, whatever your physical limitations. But what if we don't know what to do next? Often people feel a lack of direction or purpose after retirement, and many suffer from depression and social isolation. The best defense, Astor believes, is proper planning and careful consideration of how you would like to spend your retirement years. Some plans will require financial resources that will have to be provided for prior to retirement. Others plans are merely hobbies or activities that we may not have had time for with a full-time career. Astor asks, "What are your goals for this stage in life?" Your answer to that will determine how you prepare for retirement now, and how you spend your time when it arrives. He doesn't leave us with the question itself, though. An entire chapter is devoted to how to create these goals and how to find role models who inspire by helping us see all the possibilities for this time of our lives. Personally, I found the chapter entitled "All About Health Insurance" most interesting. In this section Astor describes private health insurance, government programs, and long-term care coverage. I had not previously understood the difference between the various parts of Medicare, and I found it very interesting. Astor advocates strongly for long-term care insurance for everyone--he notes that 40% of adults currently receiving long-term care are younger than age 65! He also states that 70% of individuals over age 65 will require long-term care during their lives. Astor certainly makes a strong case, and I intend to revisit the issue more thoroughly for myself, even now. "Will benefits increase with inflation?" "Is Alzheimer's disease or other dementia specifically covered?" "Does the insurer have an A rating or better from Best's Insurance Reports?" The specificity of these questions is representative of the level of detail presented by Astor throughout the book. He truly helps the reader in considering all matters relevant to each facet of retirement. It is like having an expert in your pocket who makes sure you think of everything. In the financial planning chapter "Making It Last for the Rest of Your Life," Astor leads the reader through discussions about creating a post-retirement budget, evaluating your income, determining your Social Security benefits, and finding additional financial resources. He shows realistically how liquid assets may not last as long as we might think, even if we only take from savings to cover a slight shortfall in our cash flow. With up to several decades to plan for after retirement in our 60s, we should carefully consider how we will live and how we will pay for our expenses. Astor also devotes much time in the book to discussion of how to prepare and plan for the inevitable--death. He describes types of asset ownership and methods of transfer, and how to ensure that your health care wishes are carried out. Astor discusses wills, trusts, and other types of estate planning in detail. He even provides a comprehensive checklist covering ten primary topics to discuss with your heirs, including important documents, plans for the future, finances, legal issues, and other concerns. These topics include general common knowledge, like a reminder to have a will in place, as well as details that may commonly be overlooked, like providing for your family pets' care after your death. Astor never claims to be the final word on any matter or the sole resource you'll ever need. Rather, he acts as a facilitator to open an internal dialogue for the reader about the multitude of concerns that arise as we approach retirement. Astor encourages us to do away with our preconceived notions about what it is to "grow old," and instructs us not to think of "old" as a bad word. His insights and attitude help to remind us that being old is just another way of being, one that we all hope one day to achieve. The AARP-endorsed Roadmap to the Rest of Your Life is a terrific resource. Have a copy on hand for your own retirement-related concerns, and give it as a gift to anyone in your life who is approaching retirement age. This thoughtful guide is informative, thorough, and instructive, without being overwhelming. It is also not overly general, which is a fault one might expect in a book with such a large scope of subject. Throughout, Astor provides a mass of resources, mostly web-based, for each topic discussed. In short, Astor's Roadmap is as essential to long-term planning as a Rand McNally atlas (or a GPS) is to a cross-country road trip. "Bart Astor has written a marvelous, eminently readable guide for achieving balance and happiness in all the areas of life as you grow older. Health, wealth, lifestyle, leisure, family: If you're looking for a shot-by-shot course map as you play life's back nine, this is it. This book deserves–and will earn–a prime spot on your desk or night table." 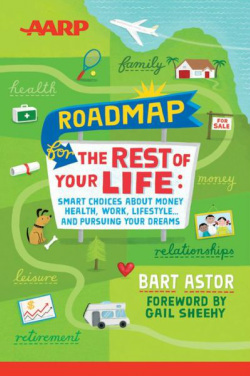 Bart Astor has written a vital, fast-paced guide to help you shape your future. This gem of a book is packed with possibilities, keen advice and rich stories. He delivers the nitty-gritty details that are essential to the big decisions you face–how to choose doctor, estate planning, housing, working in retirement and other financial strategies to make sure you don’t outlive your resources. Best of all–his optimism about the future is contagious. "In my experience, people who are most successful in this special chapter of their lives prepare themselves well in advance to meet their financial, health, intellectual, and social needs. Astor addresses all the major opportunities, issues, and challenges." "An invaluable guide - most of us baby boomers will need this helpful advice."